In this building met the convention that drafted the Constitution under which California was admitted to statehood on September 9, 1850. Robert Semple was chairman and William G. March secretary. The 48 delegates met from September 1 to October 15, 1849 on the upper floor, which ran the length of the main building. The stairway leading to the convention hall was in the rear of the building. Rev. 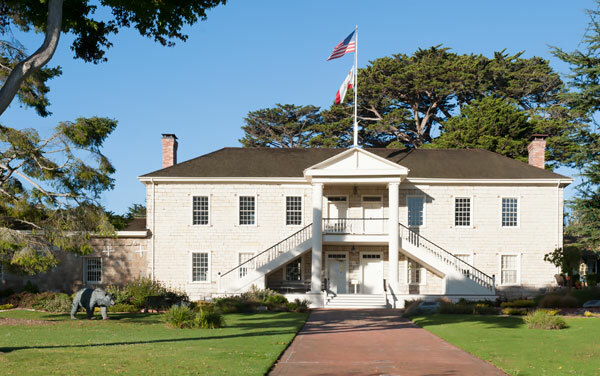 Walter Colton, first American alcalde in Monterey, erected this building as a public hall and schoolhouse, he and Robert Semple established California's first American newspaper in Monterey on August 15, 1846. Colton Hall contributes to the Old Town Historic District which is a National Landmark. We were unable to locate a California historical marker for Colton Hall.